What a surprise! I got a few cookbooks for Christmas. Hmmm, go figure. Of course, I had to jump in and try one of the new recipes as soon as possible. One of the books I got was the New York Times Cookbook which has recipes from the last 10 years or so from hundreds of chefs. I just happened to be wandering through it looking for a recipe for a blood orange sauce for fish I’m making later this week and I found a recipe for a blood orange salad instead from one of my favorite chefs, Suzanne Goin. It’s a fairly simple salad, but the ingredients need to be high quality since you really taste each one. There was quite a bit of discussion about the type of dates to use and after making and eating the salad, I would agree that you want nice, juicy dates for this. The other part of this meal was a panini, so I have to say a word about this too. One day I went to the store to buy a device to make pancakes. I found this griddle that also made paninis and since I believe in giving space to gadgets that have more than one use, I got it thinking I might make the occasional panini, but would mainly use it for those Sunday morning pancakes my stepson loves. Well, I think I’ve ended up using it twice for pancakes, but I can’t even count the number of times we’ve made paninis. They’ve become one of our favorite quick dinners. They’re delicious and with a salad are so satisfying. If you have some gift certificate money left from the holidays and are wondering what you might need for you kitchen, I would definitely recommend adding the Cuisinart panini maker to your cabinets. It’s worth the space and no, they aren’t paying me for this, but they should. -Spread 1 tsp of pesto on each side of sandwich. Put a few slices of turkey on one side. Add slices of red pepper and then top with cheese. Close sandwich and brush both sides with olive oil. -Heat griddle. Put sandwiches on griddle and close top to sear bread. Cook until cheese melts and serve immediately. -Cut the ends off the oranges. Stand oranges on end and use a sharp paring knife to take off the peel and pith, leaving the oranges whole in the process. Then slice each orange thinly. -Lay 8-10 arugula leaves on each plate. 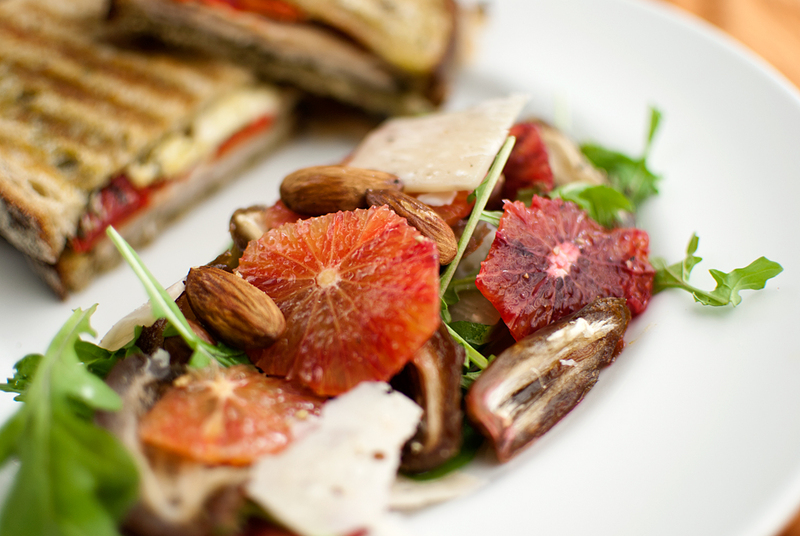 Top with date slices, then a few orange slices, parmesan slices and then a few almonds. Drizzle with a littel of the oil and a sprinkling of salt. Repeat, using up the rest of the ingredients and topping with the rest of the oil and more salt and pepper. This looks beautiful. I would love to take a look at your new cookbooks! This looks and sounds absolutely delicious, and so do the other recipes on the site. Great writing, cooking, and pictures! I’m a proud mother, I know, but you’ve come a long way from the first meal we cooked together. Love of food is one of the things I tried to instill early, and it looks like you’ve taken that and run with it.